Does General Haig deserve the title 'Butcher of the Somme'? 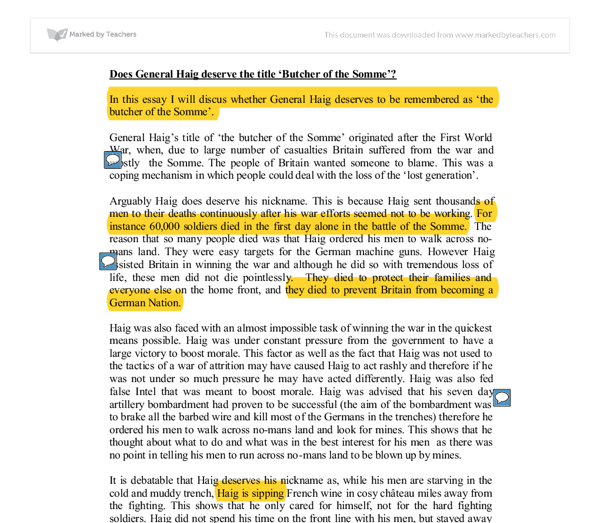 In this essay I will discus whether General Haig deserves to be remembered as 'the butcher of the Somme'. General Haig's title of 'the butcher of the Somme' originated after the First World War, when, due to large number of casualties Britain suffered from the war and mostly the Somme. The people of Britain wanted someone to blame. This was a coping mechanism in which people could deal with the loss of the 'lost generation'. Arguably Haig does deserve his nickname. This is because Haig sent thousands of men to their deaths continuously after his war efforts seemed not to be working. For instance 60,000 soldiers died in the first day alone in the battle of the Somme. The reason that so many people died was that Haig ordered his men to walk across no-mans land. They were easy targets for the German machine guns. ...read more. therefore he ordered his men to walk across no-mans land and look for mines. This shows that he thought about what to do and what was in the best interest for his men as there was no point in telling his men to run across no-mans land to be blown up by mines. It is debatable that Haig deserves his nickname as, while his men are starving in the cold and muddy trench, Haig is sipping French wine in cosy ch�teau miles away from the fighting. This shows that he only cared for himself, not for the hard fighting soldiers. Haig did not spend his time on the front line with his men, but stayed away from the direct fighting. This was done not so he could live a luxurious life, but so he was able to see a further stretch of the trenches and plan his tactics accordingly. This is compared to being on the front line and only seeing a small area of the battle field and would therefore have less well planned tactics as they would only take a small proportion of the trenches into account. ...read more. Therefore either way Haig would be considered a 'butcher'. In conclusion I believe that Haig does not deserve his title of 'the butcher of the Somme'. If the objective for a general to be successful is to win wars, then Haig must be judged as a success. Yes he sent thousands of men to their deaths, however in a war of attrition and with the limited amount of military tactics available that was the only way to win. There would always be a scapegoat for the death tolls of The Great War and are we forgetting that Haig was ordered by the government to get a large scale win? Therefore it is perfect for the government; if Haig is successful they can win the war. They also have someone to blame after the war is over thus making the public hold Haig responsible for the deaths tolls not the government. Perhaps Haig could be viewed, much like the soldiers he sent over the top as a puppet of the government. Therefore Haig does not deserve the title 'the butcher of the Somme'. ...read more. This student written piece of work is one of many that can be found in our GCSE Britain 1905-1951 section. Overall, this is an excellent response that answers the question well and is focused throughout. 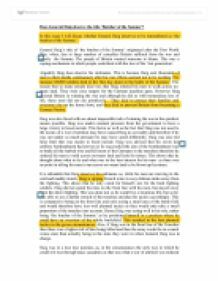 The author does well to support points with concise evidence but also ensures that both sides of the debate are considered before reaching a conclusion. The introduction is the weakest area and could have included a line of argument. 5 stars. Social improvement were also made, the empire built schools, hospitals banks. The colonies also learnt from the British Empire, they used what they learnt to further change and advance their countries customs in views, on laws such as freedom and so on. (The skilled workers went into jobs that really only required genuine skill). So this and the `leaving certificate' helped redeem the post-war situation slightly in that if lots of skilled workers died in the war, the unskilled/semi-skilled could fill their boots. Douglas Haig - Butcher Or Hero? In 1916 Haig was in Charge of the Battle of the Somme, which didn't go very well and there were lots of casualties. There, Haig was given his nickname "Butcher of the Somme" In 1918 Haig organised the final offensive, which eventually led to Allied Victory. Dunkirk - Defeat, Deliverance or Victory? This source is from the book "The Defence of The United Kingdom" I would expect this source to be reliable because it is written by an respected historian, Ben Collier. He does not seem to be biased towards Britain because the source is very negative. In anticipation that the British soldiers would simply be able to walk across no man's lands and occupy the deserted German trenches, Haig sent the men with heavy trench repair equipment. Unfortunately the German soldiers were still alive and manning their carefully positioned machine guns which the artillery bombardment also failed to destroy. There were an 'extraordinary number of rats' or 'millions' of them. They infested the trenches completely, everywhere from the dugouts to the duck-boards. They took food away from the soldiers, but also ate the dead bodies lying on the floor of the trenches. the idea, which is a 'peaceful method' that the society took pride in. However, this letter was written to persuade the Prime Minister, whereas Source 3 was written to advise. Therefore source 3 is more useful in telling historians about the role the NUWSS had during the war. WHO WAS TO BLAME FOR THE ENGLISH CIVIL WAR? He had been a success in Scotland. He came to England with strong ideas on the power that the king should have, but very little money. Scotland was poor compared to England. James Believed that god had chosen him to be king. Why were the major cities of Britain bombed by the Germans in 1940-41?